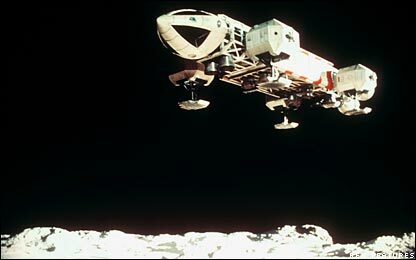 Eagle Transporter in Space 1999. Space 1999 was a syndicated British television series which ran for two seasons of 24 episodes each from 1975 to 1978. The first episode, "Breakaway," first aired on October 17, 1975, introduces the main cast and the basic premise: the Moon, along with Moonbase Alpha, is blown out of Earth's orbit and into interstellar space, by the explosion of a nuclear dump on the lunar far side. This is, of course, scientifically implausible. Any explosion powerful to expel the Moon from the Solar System would – even if the Moon survived intact – resulted in an enormous, momentary acceleration that would have put paid to anyone unfortunate enough to be on its surface at the time. Many of the plots of Space 1999 were handicapped by a similar disregard for good science. On the other hand, the series did tackle metaphysical and mystical topics (at least in the first season) in a way that was unusual for TV science fiction and fantasy shows up to this time. Some good acting peformances and careful attention to sets, props, and models made the series more memorable than its ignorance of basic astronomical and physical facts deserved. Space 1999 was the last series produced by the partnership of Sylvia and Gerry Anderson, famous for the TV series Thunderbirds, Fireball XL5, and UFO. Following the departure of Sylvia Anderson, Fred Freiberger took over as producer for the second season and immediately changed the tone of the show from thoughtful introspection to almost pure action-adventure. By general consent, the quality of the scripts declined and plots became often almost ludicrous.